Bing - One of the finest sweet cherries in the Western States. Skin is dark burgundy-red when ripe. Very large, excellent quality, firm, juicy and sweet. One of the best shippers and fresh market varieties. Very good for commercial canning. Ripens mid to late June. (Mid-season/needs pollinizer) (image). Self-Fertile Bing - Very firm, sweet fruit. Ripens 4 to 5 days after Bing. Tree is a late bloomer. Otherwise just like Bing. (Mid-season/self fertile). Black Tartarian - Very large, bright purplish-black. Tender, juicy, very rich fruit. This remarkably vigorous tree is an erect grower and immense bearer. Excellent pollinizer for most varieties. Ripens early to mid-June. (Early/needs pollinizer). Lambert - An outstanding commercial and backyard variety with dark red, heart-shaped fruit. Excellent quality, firm with rich flavor. Ripens about a week after Bing. More resistant to late frost. A vigorous tree, and heavy producer. (Late/needs pollinizer). Rainier - An outstanding, light colored, very attractive yellow cherry with red blush. Flesh is very firm, yellowish-white and finely textured. Fruit sizes well with a distinct flavor considered superior to most varieties. Tree is hardy, bears early with good bud hardiness. Fruit is quite resistant to cracking. Ripens early June. (Early/needs pollinizer). Royal Ann / Napoleon - Extremely appealing light yellow cherry with red cheeks. Fruit is large, firm and flavorful with colorless juice. A high quality processing and outstanding dessert variety. Requires cross pollinization. Black Tartarian is one of the best. Ripens early June. (Early/needs pollinizer). Sam - A new black cherry out of Canada that shows good resistance to cracking. The tree is vigorous, upright and spreading. The fruit is large, black, firm and of good quality. Self-infertile, but will pollinize most other varieties. Ripens mid to late June. 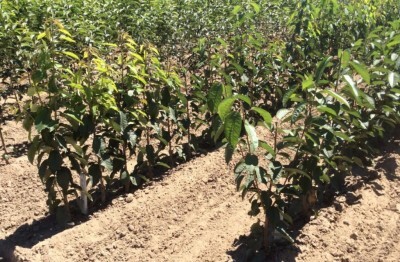 Stella - The first good quality, self-fertile black cherry. The fruit is good size, moderately firm, heart-shaped with appearance and flavor similar to Lambert. Does very well west of the Cascades. More crack resistant than Bing. Good pollinizer for other sweet cherries. Ripens mid-June. (Mid-season/self-fertile) ​(image). Stella, Compact - Has all the outstanding characteristics of the parent, but is a dwarf plant. Does well west of the Cascades and most mild-winter areas and is excellent for home gardeners with limited space. More crack-resistant than Bing. Self-fertile and a good pollinizer for other sweet cherries. Van - Tree is hardy and bears early. Fruit is medium size, skin color is shiny dark. Cherry much like the Bing but more tart. Tree bears heavy and is resistant to cracking. (Mid-season/needs pollinizer). English Morello - Late ripening, deep red, nearly black fruit. Flesh is dark red and slightly tart. Excellent for pies. Good pollinizer. Low chilling requirement. Montmorency - A tart, medium size, dark red cherry with good quality and flavor. 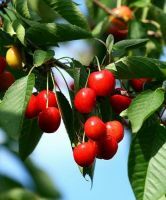 One of the most popular sour cherries in America for home and commercial use. A very productive tree that produces a good shipping fruit. Self-fertile and a good pollinizer. Ripens mid-June to early July. 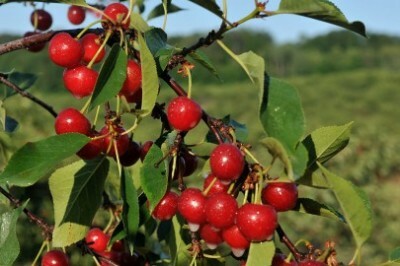 North Star - A natural-dwarf sour cherry that is extremely hardy. Bears full-size, deep mahogany fruit. Flesh is dark red, juicy and meaty. A very productive tree that is self-fruitful. An early ripener that is excellent for pies, cooking or freezing. Ripens June. (Early/self fertile).